I was craving for my Childhood favorite snack “Swiss” Bakery’s chicken bun..But I only had beef kima at home and made beef bun instead ..Alhamdulillah it turned out too good…Tastes exactly like Swiss’s chicken bun ( according to my husband, at some point it’s better than Swiiss!!!!! )…I didn’t bake it..It’s deep fried bun just like swiss’s one!!!!!!!!!!! Milk ( luke warm or room temperature), just enough to knead the dough. Boil minced beef with little ginger-garlic paste, cardamom, cinnamon,bayleaf, soy sauce, tomato ketchup, salt and little chili powder. Dry out the water then mix the keema with finely chopped onion, green chili, capsicum and green peas. 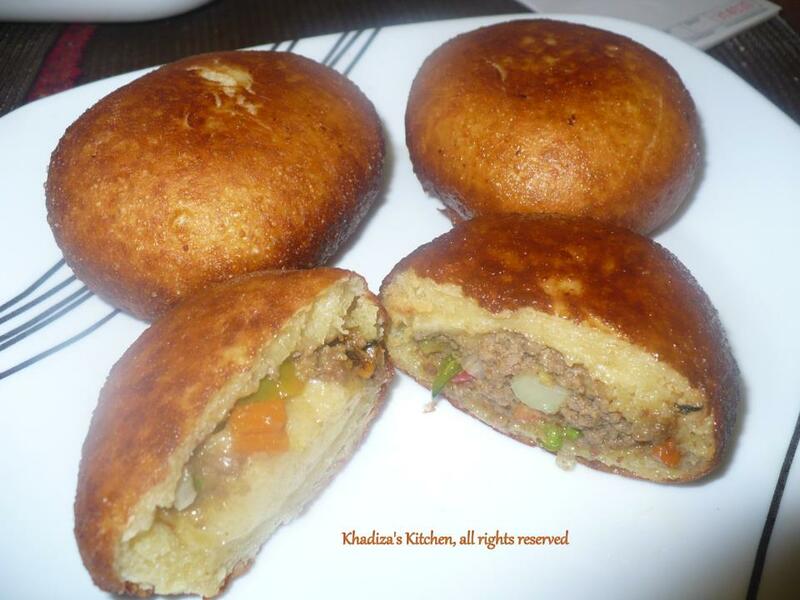 1.Take a bowl and put all the ingredients mentioned for bun . Knead well and make a dough. Rub little oil on the surface of the dough and keep it in a warm place, in a closed box until it doubles up in volume. 2. Punch down the dough lightly using your palm and divide it equally into balls. Flatten them into small discs and fill them with the filling. Re-shape them into a ball. Keep them aside. 3. Deep fry the balls on low medium heat until brown. Fry one at a time as it expands after putting it in oil. 1. Don’t fry on high flame, you may end up making buns ,uncooked in the middle. 2. Before you put the bun in oil, make sure your oil is hot enough , but not that hot which may bring color on your bun too soon , leaving the center uncooked. And the oil should not be cold too. Heat oil on medium low flame from the beginning. This entry was posted in Glossary / Notes, Snacks, Snacks and Lighter Fare and tagged Bun, Chicken Bun, Stuffed Bun, Stuffed roll. Bookmark the permalink. Assalamualaiqum… Can u pls tell me how many bun will come out from 2 & half cup flours? Hi, how much minced beef did you take? Thanks. Hello….. Thanks for sharing such lovely recipes.. I love Swiss baskery… N was wondering whether u have a recipe for their chicken burger with mayo?